The Fren family roll down the hill at Parliament House during a ‘Travel Guides’ visit to Canberra. 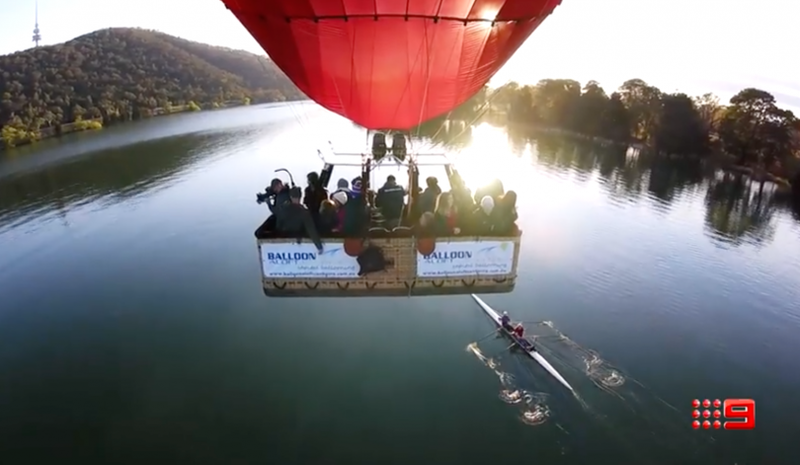 The image is a still from Nine’s ‘Travel Guides’ Canberra promotional video. 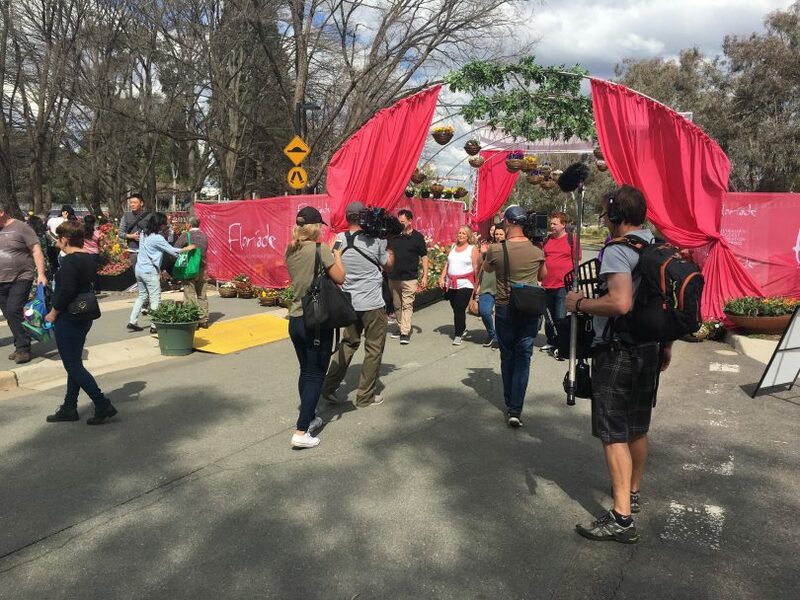 High-rating Australian television series Travel Guides comes to Canberra tomorrow (2 April) night for its last episode of the season – shining a national spotlight on many of the bush capital’s top attractions, including Jamala Wildlife Lodge, Parliament House, Floriade, GoBoat and the Australian Institute of Sport. The funny Nine Network reality series last week topped its time slot with 915,000 viewers and this week is out to find out if “there’s more to Canberra than pollies and public servants”. The five different groups of ordinary Aussies turned travel critics will take in the sights of our city and indulge in a range of antics in the process. On a visit to Parliament House, we will apparently see the popular Fren family from Newcastle uncover the mystery of the missing Prime Ministerial portraits before “rolling down the building’s grassy roof on their bellies”. Then they will drop into the Australian Institute of Sport where viewers will have the taxing task of seeing if they can tell the difference between the Frens and the nation’s elite athletes. Filming for the episode occurred between September 22 and 30 during Floriade last year but it has been kept under wraps until now. VisitCanberra Director Jonathan Kobus sees the reality show’s visit to Canberra as a great way to showcase the city’s attractions. “Being featured on Travel Guides is a great way for Canberra to show the diversity of experiences our city offers a range of audiences,” Mr Kobus said. The Fren family being filmed during a ‘Travel Guides’ visit to Canberra during Floriade last September. Photo: Supplied by VisitCanberra. For the guides themselves, it’s all about having fun while they work out how many stars to give their Canberra holiday. Twin sisters Stack and Mel accidentally leave their mark on Floriade in an effort to take the perfect selfie while at night they hit “terrifying heights” on the Ferris wheel at Floriade’s NightFest. Best mates Kev, Dorian and Teng add to the action when they have an unlikely romantic encounter in the basket of a hot air balloon as they take in Canberra’s views. The travel guides get to enjoy the views from a hot air balloon during their visit to Canberra. 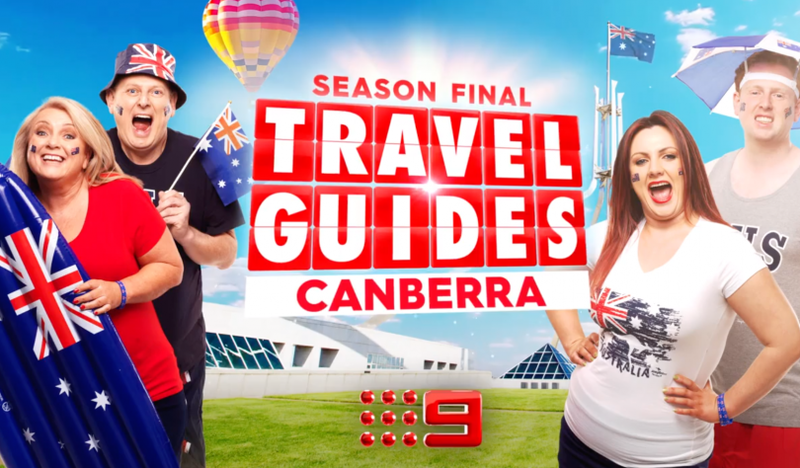 The image is a still from Nine’s ‘Travel Guides’ Canberra promotional video. The guides will also discover Canberra’s ‘wild side’ as they spend the night at Jamala Wildlife Lodge and find out what it is like to sleep in close proximity to cheetahs, lions and tigers. 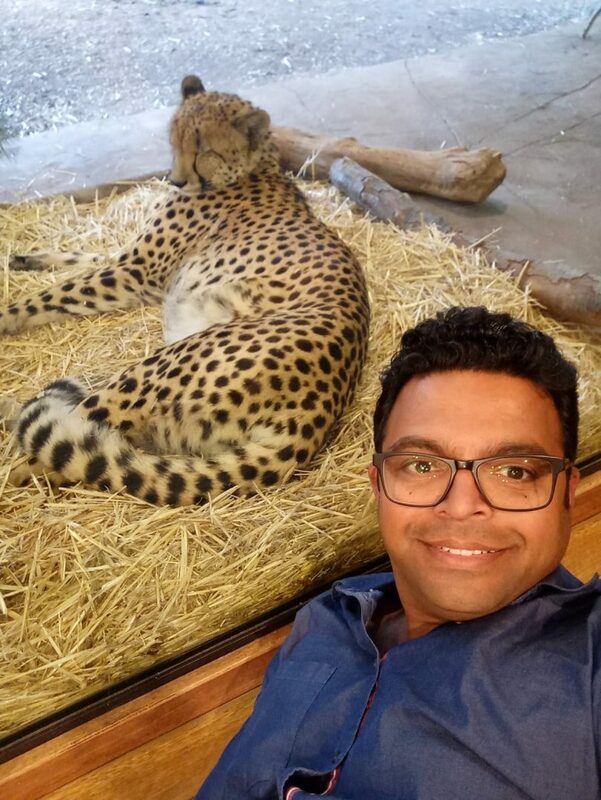 Deepesh gets close to a cheetah during a night at Jamala Wildlife Lodge. Photo supplied. It seems that some of Canberra’s more infamous attractions also get a look in. “Driving across town, the highlight for some is a glimpse of the capital’s most notorious, and phallic-shaped, outdoor sculpture,” says the program’s publicity unit. On their final day in Canberra, the guides captain a GoBoat on Lake Burley Griffin, but, perhaps not surprisingly, the Fren family’s navigation skills leave a lot to be desired. The Travel Guides Canberra episode screens tomorrow night (2 April) at 8:40 pm on Channel Nine. Below is a promotional video of the episode sourced from Nine’s Travel Guides Facebook site. We've saved the biggest belly laughs for last! ? #9TravelGuides, tomorrow 8.40pm. Em Starczewski omg. I’m going to miss it. Renée Andrews they visited it! Canberra icon! They’re going to show the owl sculpture. Reminds me of when a relative came here from interstate in the late 1980s and I accompanied him on a tour of Canberra in a bus. We went to Fyshwick and outside Capital Duplicators in Molonglo Mall we were told “This is where your X-rated videos are produced”. This is the best show on tv. No lying no cheating no fake lips etc , just lots of laughs. They have been to some amazing places! No really sure why Canberra but I’m looking forward to watching and laughing . It is very hard to find anything positive to say about this show. It seems to have little to do with being travel guides, unfortunately the behaviour is embarrassing. In all my travels overseas I didn’t see such appalling behaviour from anyone. I wouldn’t put much credence on their opinion of Canberra. I hope I’m wrong. Anyway I thought that a fence had been put up to stop people rolling down the Parliament House grass, or is that something else that hasn’t happened yet? So how is it that these people could do it for the show? I doubt that I’ll bother watching, I cringe just seeing the promos. As I said I hope I’m wrong but I can’t see why they would change. Michael Babb the brindabellas, Corin forest, gilbraltar falls, namadgi, the crazy shakes we are famous for, our restaurants and nightlife. The lodge, national museum of Australia, etc?